Oliver Queen has faced many different types of bad guys during Arrow, but most of their skills can actually be learned in real life. Aside from Slade Wilson and his army in Season 2, and Ray Bivolo during the crossover between Arrow and The Flash, most of his adversaries have been talented, but not superpowered. Well, Oliver’s going to have to up his game later this season when he deals with a new bad guy with special abilities. It’s been announced that actor Doug Jones has been cast as DC Comics villain Jake Simmons, a.k.a. Deathbolt. Debuting in Episode 19, titled “Broken Arrow,” Simmons is labeled by IGN as a metahuman with the ability to “harness and weaponize plasma energy.” It’s unclear if Simmons’ powers are a result of the Central City particle accelerator or if he gained these powers elsewhere. Here's what he looks like, though his appearance may change for live action. In the comics, Simmons was introduced in 1983 as a wanted murderer who fled from police in a stolen biplane. His plane was struck by lightning and crashed in Meteor Crater, Arizona, where the super villain Ultra Humanite found Simmons and subjected him to multiple electrical experiments. The result was Simmons’ body being charged like a battery, and with the ability to manipulate electric energy, he became Deathbolt. 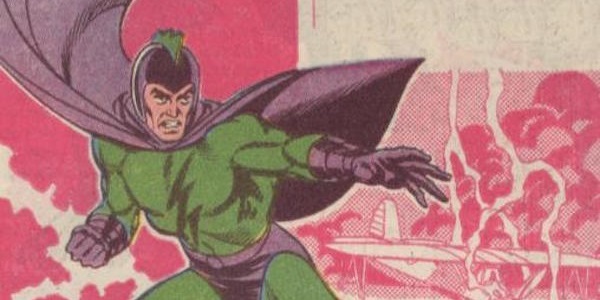 He is one of the more obscure villains from the DC universe, having only fought Starman and the All-Star Squadon, a group of superheroes from World War II. Although his powers are basically the same on TV, there’s so little source material on Simmons that Arrow will likely put their own spin on the character in a way that works for the story. So far on Arrow, the only source of superhuman abilities has been the Mirakuru serum, although it’s suspected there’s something unusual going on with Ra’s al Ghul, namely the way he's lived for centuries). Granted, the world of Arrow is no longer grounded in reality thanks to the events of The Flash, but the show itself has primarily stuck to traditional action scenes and impressive stunts. As organized and efficient as Team Arrow is, they don’t have a lot of experience dealing with metahumans, so when Simmons shows up in Starling City, facing him will be one of their more difficult challenges. This might require creating some new trick arrows. Jones is primarily know for playing characters that require heavy makeup or digital effects, including the Silver Surfer in Fantastic Four: Rise of the Silver Surfer and Abe Sapien in the Hellboy movies. His more recent roles include playing Cochise in Falling Skies and The Ancient in The Strain. He will also be appearing in Guillermo del Toro’s Crimson Peak later this year.